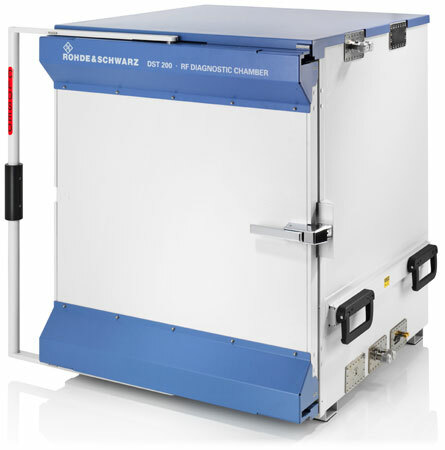 Rohde & Schwarz has added three new options for its compact R&S®DST200 RF diagnostic chamber: theR&S®DST-B160 automated 3D positioner, the R&S®DST-B210 cross-polarized test antenna and the R&S®DST-B270 communications antenna. The new options significantly speed up precompliance testing of wireless devices, allowing automated test sequences to be performed on the lab bench so that developers no longer require constant access to large RF test chambers. The R&S®DST200 RF diagnostic chamber together with the R&S®CMW500 wideband communication tester from Rohde & Schwarz now enables fast, reproducible over-the-air (OTA) testing in accordance with the Cellular Telecommunications Industry Association (CTIA) test specification. In conjunction with an R&S®ESU EMI test receiver from Rohde & Schwarz, the new options make it possible to carry out radiated spurious emission (RSE) measurements quickly and easily with the R&S®DST200. These test setups are ideal for wireless device design optimization. Developers can compare the results generated with the R&S®DST200 with the results obtained with larger RF test chambers, since similar test sequences are used in these chambers. The results generated with the different types of chambers exhibit a high level of correlation, differing from each other by no more than a few decibels. Using this solution, network operators can now perform conclusive qualification measurements on smartphones, for example, without the need to access large RF test chambers. The new R&S®DST-B160 automated 3D positioner uses servomotors to position the EUT in any orientation required for OTA measurements, eliminating the need for time-consuming manual positioning. The R&S®AMS32 OTA performance measurement software supports all cellular standards, including LTE MIMO, as well as WLAN and Bluetooth, plus it enables assisted GPS (A-GPS) performance measurements. In RSE measurements, the system automatically determines the EUT position with the highest RF emission, and then uses the R&S®EMC32 software to perform EMC measurements in accordance with ETSI EN 301 908 (for W-CDMA) or a similar standard. The R&S®DST-B160 automated 3D positioner is made of a special, low relative permittivity material for RF applications so as to minimize its effect on the measurements. The servomotors are accommodated in an RF shielded compartment at the bottom of the R&S®DST200. The user attaches the EUT to a removable holder, which is snapped into a bracket so that the EUT is positioned at the center of the R&S®DST-B160. The EUT can be rotated independently about two axes into any desired position relative to the test antenna. The new R&S®DST-B210 cross-polarized test antenna is designed for testing wireless devices and chipsets with the R&S®DST200. The antenna has a wide frequency range of 300 MHz to 12 GHz, ensuring that all harmonics will be covered when performing RSE measurements. The R&S®DST-B270 linear-polarized communications antenna has a frequency range of 700 MHz to 18 GHz and provides a stable connection between the EUT and the test receiver while the EUT is being rotated.